Established in 1994, The Space and Systems Development Laboratory (SSDL) develops innovative technologies for robust distributed systems, with special interest in space environments. Since then, SSDL has successfully flown five satellites, demonstrating the capabilities of small spacecraft as cost-efficient platforms for a variety of payloads. SSDL has partnered with a wide range of groups, spanning U.S. government agencies, large corporations, fellow universities, and local high schools. The current satellite mission under development at the SSDL is the KatySat satellite. The KatySat mission provides a powerful educational outreach tool for K-12 students that can be readily expanded for future missions. KatySat will be controllable by students, making space fun and exciting. With this hands-on approach to controlling an actual satellite, SSDL hopes to encourage students to pursue fields related to science and technology. By utilizing low-cost methods, KatySat engineers hope to stay within reasonable reach of typical education budgets. Students will be able to communicate with KatySat directly with radio hardware or indirectly via the Internet. With this development, the KatySat mission aspires to develop a common platform that will be usable by the CubeSat community. The completed KatySat bus will allow future CubeSat missions to spend less time on architecture development and more time creating innovative mission applications. To facilitate the KatySat mission, SSDL partnered with Total Phase, Inc. to provide students the tools necessary for embedded system development. Total Phase is a leading provider of embedded systems development tools. Total Phase's mission is to create powerful, high-quality, and affordable solutions for the embedded engineer. The simplicity and ease of integration of Total Phase products have led to many unique engineering solutions. As customers build Total Phase products into their systems, Total Phase actively incorporates their feedback, building the solutions that engineers find most valuable. The development of KatSat has benefited from the use of the SPI Development Kit in several ways. Using the Beagle I2C/SPI Protocol Analyzer, a magnetometer was integrated into the KatySat bus. The Beagle analyzer was used to verify that proper communications were taking place. The master device is a MSP430F1611 device with a hardware synchronous SPI port and the slave device is the MicroMag3. The Beagle analyzer was used to verify the proper address and data bytes were being transferred to the magnetometer. 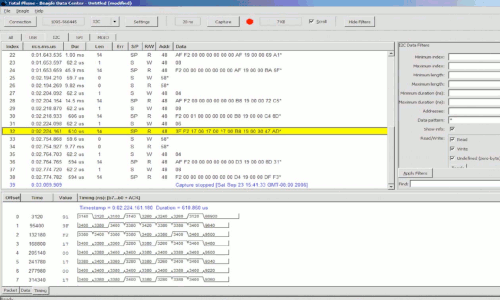 The Beagle analyzer was also used to verify the proper timing at the bit level and during SPI port sharing operations. 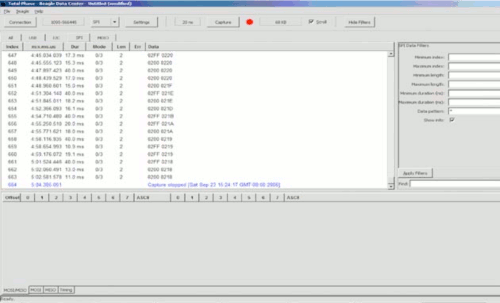 Figure 2: .SPI data capture with the Total Phase Beagle Data Center software interface. KatySat was also expanded to a multiprocessor architecture to extend the payload mission using the Beagle analyzer. Two MSP430 processors were configured to transfer photo data by I2C between the SD card storage and a 2.4 GHz radio. The master device is the KatySat flight processor and the slave device is the KatySat payload processor. 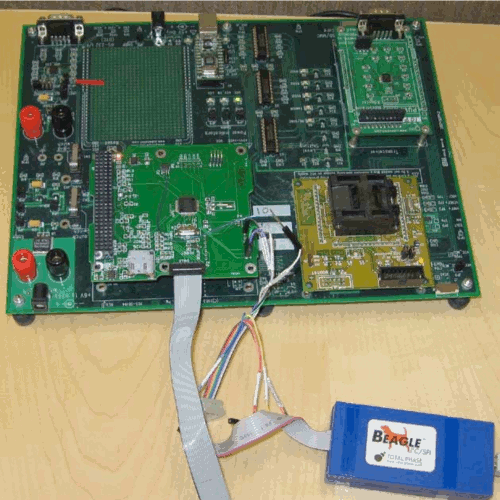 The Beagle I2C/SPI Protocol Analyzer was used to debug the communications between the two processors. Proper transmission of address and packet payload information was verified using the Beagle Data Center software interface and data capture. The SSDL also conducts a spacecraft design class at Stanford. To complement the class, KatySat components are produced for student team use. The final test of the Beagle analyzer was in this production environment. The Beagle analyzer was used to gather final acceptance testing data of the production units. Each record was saved through the Beagle Data Center software environment allowing each board checkout to be finalized. Total Phase support of SSDL has allowed students to speed the engineering development of the KatySat satellite. The Beagle tool suite has provided superior insight into the SPI and I2C protocols which complements the students learning process. SSDL will continue to use Total Phase products in the future to assist in development efforts.